A staggering 66 billion chickens are slaughtered for human use each year. Broiler chickens, raised for their meat, are bred to grow so quickly that their legs often collapse under their artificially enhanced weight, crippling them. They are killed at about 40 days old, already heavier than the average adult laying hen. Many die of starvation and dehydration because their broken legs will not carry them to food and water. They are crammed by the tens of thousands into sheds thick with ammonia fumes. They routinely suffer broken bones from being grabbed by their legs and violently stuffed or thrown into crates, or from being slammed into shackles upside-down at the slaughterhouse. Laying hens are raised solely to lay eggs. They are kept either in barren wire battery cages, sheds or semi-outdoors (called free-range). Their parents (breeders) are kept in crammed conditions until they are killed. The hens become red and raw from constant mating. They lay fertile eggs which hatch to become laying hens. 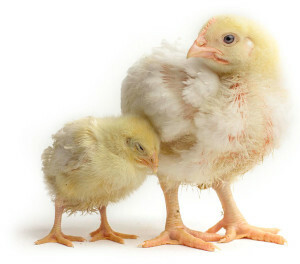 Half of the chicks hatched are male, who are useless to the industry because they don’t lay eggs. They are disposed of either by being gassed, or dropped into industrial shredders and ground up while fully conscious. 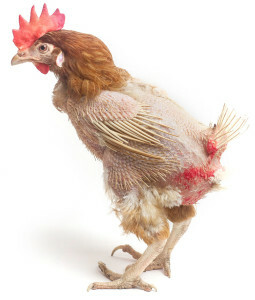 Laying hens now lay around 300 eggs per year, instead of the 12 or so once laid by their jungle fowl ancestors. Despite a lifespan of up to ten years, these hens are sent to slaughter at about 18 months of age, when they are no longer considered ‘profitable’.